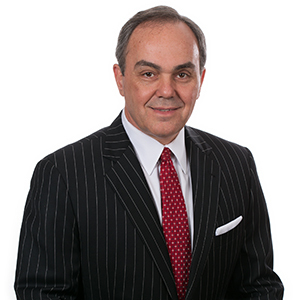 Craig P. Kalil has practiced complex commercial litigation for close to three decades. He has represented private and governmental clients in a wide range of domestic and international matters, in all of the federal and most of the state courts in Florida, and in many more state and federal courts across the U.S., including the U.S. Tax Court and the U.S. Supreme Court. He has developed a particular depth of experience in the representation of large businesses involved in multi-district and class-action litigation, both as plaintiff and defendant. He is peer-reviewed as “AV” by the U.S.A.’s premier rating organization, Martindale-Hubbel, denoting the highest possible level of skill and ethics. Craig Kalil was born in Johannesburg, South Africa in 1961 and lived in several countries in Europe and different states around the U.S. before his family settled in Miami. He studied at the University of Miami School of Business, earning his Bachelor’s Degree in Business Administration in 1983, and then went on to the university’s School of Law, where he earned his Juris Doctor degree, with honors, in 1986. Craig began his legal career in the Miami office of Squire, Sanders & Dempsey (now Squire Patton Boggs), where he first clerked for, and then as an attorney alongside, Henk Milne, who was destined to be his partner at AMK. The U.S. was then in the midst of one of its periodic national real estate crises engendered by unsafe lending by financial institutions. Craig’s first years as a lawyer involved many long days, weeks, and months, helping various agencies of the U.S. government – The Federal Deposit Insurance Corporation, The Federal Savings and Loan Insurance Corporation, The Federal Asset Disposition Association, and The Resolution Trust Corporation – as they took control of failed savings and loans and worked to recover their secured assets. Given the overwhelming mass of S&L cases, as a very junior lawyer Craig found himself personally handling dozens of complex commercial foreclosures, beginning to end, frequently in the face of counterclaims advancing the then-nascent concept of “lender liability.” In his early years of practice, Craig successfully tried a number of multi-million dollar cases to judgment as “first chair” in federal courts in towns and cities around South Florida, from Palm Beach down to Key West, and from Fort Lauderdale across to Naples. The deficiencies that often resulted spawned satellite recovery litigation against bank directors and officers, law firms, appraisers, accountants, and other professional complicit in the usually negligent and sometimes fraudulent underwriting of the loans – with the defense often financed and guided by several tiers of insurers. This latter element led to Craig’s developing substantial skill in judging and exploiting the leverage available to pressure settlement contributions from the various tiers of coverage, through statutory and common law “bad faith” insurance doctrines, through direct negotiation and formal mediation. As he developed experience in asset recovery litigation, Craig found himself increasingly in demand by large private clients, typically insurance companies and investment funds, which held part of their portfolios in Florida real estate. Significant clients included Teachers Insurance and Annuity Association, College Retirement Equities Fund, Prudential Insurance, Metropolitan Life Insurance, and New York Life. Typically such litigation involved large commercial real estate developments such as regional shopping malls, strip shopping centers, office buildings, hotels, mixed-use projects, golf courses, and planned suburban developments. Handling such disputes gave Craig deep exposure to the many and varied issues involved in complex, multi-occupancy projects, such as the appointment of receivers, the resolution of lien claims and title issues, and disputes with architects, engineers, general contractors, and sub-contractors, fights to stave off demolition orders, and the negotiation or litigation over the claims or edicts of local zoning authorities and municipal governments. By extension, Craig also came to represent private developers in disputes involving land use and zoning, environmental impacts and mitigation, and disputes with contractors and municipalities. His deepening involvement in real estate issues eventually further extended to the handling of disputes between commercial landlords and tenants (from both sides) and the interpretation of condominium association documents and rules, and he eventually became qualified to write title insurance for insurance companies in Florida. In the ’80s and ’90s the State was growing rapidly from being a relatively sleepy Southern backwater towards its current position as the third most populous, ahead of New York and behind only California and Texas. Development was burgeoning in downtown Miami, south along Brickell Avenue, westward into The Everglades, and eastward to South Beach, as well as along all the available oceanfront in South Florida. This was driven largely by Latin American and European private investment, the majority from completely legitimate sources, but also, significantly, in the process of laundering the proceeds of drug crime. Craig found the international aspects of his own litigation practice correspondingly ever-deepening. He became increasingly exposed to the typical off-shore trust and corporate structures used as the vehicles to hold such investments and transmit the wealth inter-generationally. The same vehicles were often also used by money-launderers and fraudsters to camouflage the source and destination of illegal funds. His developing understanding of the use of such structures was to prove invaluable for his growing involvement in actions against fraudsters and the tracing and recovery of assets. At that time, Squire’s focus was primarily on Eastern Europe which was then opening up to the capitalist West. Craig’s belief that the future of Miami was tied primarily to the economy of Latin America, and subsidiarily to Western Europe, led him to accept Arturo Aballí’s and Henk Milne’s invitation to leave Squire in 1993 and establish AMK, as a legal boutique uniquely focused in Miami on international transactions, tax, trusts, corporations, and dispute resolution. As befitted their long relationships with the firm, the transition was extremely friendly, with Squire essentially helping set AMK up in business. At his new firm, Craig’s practice rapidly expanded to cover the gamut of complex, commercial disputes in which the firm’s foreign and domestic clients were involved. Without attempting to be exhaustive, over the last 22 years at AMK, Craig has defended clients against antitrust and RICO (Racketeering and Corrupt Organizations) claims; handled many admiralty actions, including private and commercial vessel arrests and lien enforcements; represented owners in mega-yacht construction, purchase, sale, and leasing disputes, allisions, collisions, seizures and shipyard bankruptcies; represented owners in private jet aircraft purchase, repair, and crash litigation, and successfully contested sales and use tax assessments on aircraft, and back tax and penalty assessments in the U.S. Tax Court; handled trademark and licensing disputes; represented major boxing promoters and title contenders in state and Indian tribal courts; represented manufacturers, importers, exporters, distributors, brokers, and franchisees, in disputes concerning a whole range of industries from foodstuffs, through art and textiles, to international armament sales; conducted domestic and international arbitrations; represented institutional employers and senior executives in termination, non-competition, and non-solicitation disputes; represented professional clients, including attorneys, physicians, and auctioneers, before State licensing and disciplinary boards; and has had extensive experience in the representation of corporate and institutional clients who have been the victims of domestic and international frauds, obtaining non-dischargeable judgments against the perpetrators, and successfully pursuing asset-recovery litigation, and the exception to discharge of the fraudsters in adversary proceedings in federal bankruptcy court. In the course of his work, Craig routinely works cooperatively with co-counsel around the U.S., in Europe, Asia, the Caribbean, and Latin America. A very significant part of Craig’s practice over the past two decades has been the representation of large North American corporate clients joined as defendants in multi-state and multi-district litigation. He has served both as lead coordinating counsel for such defendants, helping to plan and execute collaborative, nationwide defense strategies, and as local counsel, working with lead counsel from prominent law firms from around the country, in cases seeking class action certification or cases involving multi-district litigation. The industries involved have ranged from various lines of insurance, such as worker’s compensation insurance, health care insurance, and managed care insurance, to national grocery chains. In the course of such work, Craig has represented both plaintiffs seeking class certification and defendants opposing class certification. He has acted as co-counsel for plaintiffs in cases certified for class action treatment, and has also successfully opposed efforts to certify class actions against AMK clients, both on a state-wide and a national basis. In common with AMK’s other name partners, Craig is peer-reviewed as “AV” by the U.S.A’s premier rating organization, Martindale-Hubbel, denoting the highest possible level of skill and ethics. Tien v. Tien, 155 So. 3d 359 (Fla. 3d DCA 2014). Atkinson v. Wal-Mart Stores, Inc., 2011 WL 68467747 (M.D. Fla. Dec. 29, 2011). Tien v. Royal Bank of Canada, 36 So. 3d 682 (3d DCA 2010). American Dental Association v. Cigna Corp., 605 F.3d 1283 (11th Cir. 2010). American University of the Caribbean v. Tien, 26 So. 3d 56, (Fla. 3d DCA 2010). Wachovia Bank, N.A. v. Tien, 534 F. Supp.2d, 1267 (S.D. Fla. 2007). Haire v. Florida Dept. of Agriculture and Consumer Services, 870 So. 2d 774 (Fla. 2004). Sandwich Chef of Texas, Inc. v. Reliance Nat. Indem. Ins Co., 319 F.3d 205 (5th Cir 2003). Florida Dept. of Agriculture and Consumer Services v. Haire, 836 So. 2d 1040, (Fla. 4th DCA 2003). Bristol Hotel Management Corp. v. Aetna Cas. & Sur. Co., 20 F. Supp. 2d 1345 (S.D. Fla. 1998). Whatmore v. Babcock, 685 So. 2d 82 (Fla. 3d DCA 1996). Craig is married to his high-school sweetheart and they have two children. He and his wife love the outdoors and particularly the Everglades and Biscayne Bay, which they explore by boat and kayak as often as time permits. Craig loves good food and wine and hunts and fishes – and cooks what he catches. Craig is devoted to his family and they have recently, together, travelled completely around the world.